I’m always happy to welcome a returning hero but could they PLEASE correct the spelling of Gerritsen on that sign? How embarrassing! 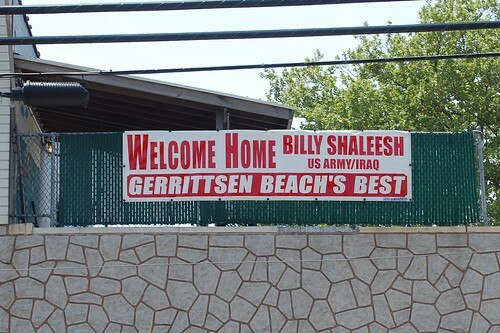 Billy Shaleesh, the young man who returned from duty in Iraq had previously served during Gulf War One. He has been home for a few days, and I must add, his parents are wonderful neighbors. As for the spelling of Gerritsen Beach. I wouldn’t go so far as to call it an embarrassment, because of the history of the spelling. First, the GBPOA is legally known as the Gerrittsen Beach Property Owners Association, Inc. because that is how the name was spelled when the property owners association was founded in 1922. The original family name was often spelled differently in one document after another. The clerical error took place in the bureaucratic halls downtown, when the signs for “Gerrittsen Avenue” were replaced with new signs and the spelling was changed to “Gerritsen”. While I usually agree with most of what LQuinlan writes, I would love to turn the clock back to the time when a community was told, “too bad” the signs are made, and it’s too late to change the signs, live with it”. What would you have written then. How embarrassing! One person has been accounting for the comings and goings of the young men and women from our community and having those signs made and placed on the wall at the Cort Club. He has done so without taking a bow, although there are many of us who know it is Buddy DeWitt. Maybe we should change the name back to the original spelling legally, and confuse the politicians who find there way here for photo opportunities and sweet talk. What would the same politicians say, if the Courts agreed to the change. On second thought, I wouldn’t advocate such a change, since they know where Gerritsen Beach is located, and they have seen the flooded Frank Court and it may be another 2 to 9 years before anything is done about it. By that time, the people in this city may vote for “term limits”. It was not my intent to knock someone doing something nice for a returning veteran but it was natural to think the spelling was a mistake. Gerritsen hasn’t been spelled that way in my lifetime…and I’ve been alive a pretty long time. Even the name of this website doesn’t spell it with two Ts so, if I’m wrong, I stand corrected. I’m sure I’m not the only one who thought it was wrong, just the only one with a big enough mouth to say so. God bless Buddy DeWitt for recognizing real life heroes. Welcome back Billy & thank you for all your service! Legal name of the Vollies is Gerrittsen Beach Fire Volunteers – two t’s & they’ve been around since I think 1917. And in 2007 they Vollies sold the lot right out from under the community. Does it really matter. I thought the post was about a guy coming home. So please quit your bitchen and leave it alone. Just say welcome home. Just a little tongue-in-cheek history lesson, LQuinlan… Whenever you contribute something to this website, it is always with the good of this community in mind. You’re right about one “t” in the name of this site, but the publisher is ttoo young to have given much thought to the original spelling. Although, he had/has grandparents among the original settlers in Gerrittsen Beach. I have been looking at that sign on the Vollies across from my house my entire life, the newer one and the older one, and was not sure who had it correct, the Fire Dept or the city. I gave the Vollies the benefit of the doubt. Thank you for setting the history straight for me. Thanks for your thoughtful explanation, George, and of course, WELCOME HOME, BILLY. I don’t know you but I thank you and all of your fellow veterans for your service to all Americans. No one is ‘bitchen’, anonymous. If you had all of the facts about the young man’s departure and his homecoming, you would realize that has been of prime importance, and that healthy people are having a friendly exchange. Acknowledging the particular role Buddy DeWitt has played in placing the “Welcome Home” banners, with the assistance of members of the Cort Club. (We have lost count, but the number of banners may have numbered over 40) it may not have been the most appropriate place to explain the two variations of spelling Gerritsen Beach, for which I apologize, but we are communicating with the people from this community, and a little education about the community never hurt. The important thing is that, as in the past, the young men and women from Gerritsen Beach are more than willing to serve our nation, and the people in Gerritsen Beach welcome them home. I attended Billy’s going away party, and on behalf of the VFW Argonne Marine Park Post 107, presented him with telephone cards for him and his outfit. More than 20 men for whom a banner was made and placed on the side of the Cort Club, are now members of VFW Post #107. Blogs cause many reactions. Some on target, some inappropriate. To each of you, we have welcomed home, make use of your Veterans benefits, talk to men and women who served before you, so you don’t have to learn the hard way, not everyone who mouths “support the troops” is ready to welcome you home. Hey Billy! Welcome again! Hope we can all get together soon! A Resurrection reunion!!! Welcome home, God Bless, and Thank You. I would like to personally thank everyone for the great “Welcome Home” and support that the beach has shown for all the men and woman serving overseas. Again Thank You and I hope will see all of you soon around the neighborhood.